Wild Apricot’s mission from our inception has been to help small membership organizations like yours, to grow and flourish. Over the years we’ve put out 65 major releases + 4 updates to our mobile apps, offering hundreds of requested features. All designed to make the lives of people running membership-based organizations easier. And we’ve been innovating in other areas too. You may recall, that since 2014, we’ve held focus groups to talk to our clients to learn more about their pain points and struggles. We discovered that you needed more that just software to grow your organizations. And so, we launched our Expert Webinar Series that saw experts from different industries and fields, sharing their knowledge with you. It has been a resounding success, due to your participation and enthusiasm to learn! “Excellent presentation. I hope you will do more along these lines especially for nonprofits.” - Kristine C.
“Great ideas presented. Our organization currently uses many of these ideas with the volunteer program. There will be more added, thanks to this webinar! Thank you!” - Karin M.
"This is my first Wild Apricot webinar, and it was incredibly helpful.” - Martha A. Staying true to our values of always consulting with our clients, we held a “3 question survey”, that pointed out that you were looking for more actionable and how-to advice, that you could implement quickly. They have been pretty successful as well, with almost 2,500 people registering for the courses and subsequent workshops we’ve held. All these experimental offerings led us to a realization: Our users need our #1 rated software + expert advice and knowledge, to be successful. After talking to clients and seeing the success of our educational offerings - we have decided to combine our previously labelled “Knowledge” and “Community” portals - into one overarching vision: Wild Apricot Membership Academy. This will now be your classroom for all things membership related. The Academy was designed to be a hub for everything you need to run your organization more efficiently. Articles: Dubbed the “wikipedia for Membership Organizations” , it houses over 120 articles with key insights and best practices from around the world of membership, volunteering, events and much more. Expert Webinars: We hold Live Expert Webinars every month, with some of the leading industry experts to provide you with powerful, game-changing coaching and advice. Our webinars are also CAE (Certified Association Executive) Accredited, which means you can earn credits towards becoming a CAE! 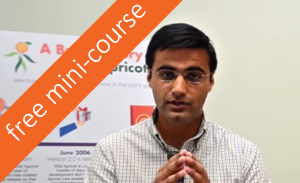 Courses: This is our latest offering that provides step-by-step instructions in a multi-media course format, so that you can learn at your own pace and at your own convenience. We include videos, screenshots and graphics to help you visualize all the concepts and strategies. Community: Our Membership Community is the place to connect with similar people, in similar roles, facing similar obstacles. Here, you can find recordings of dozens of group conference calls, 1-on-1 interviews with industry leaders and riveting Podcasts that cover a variety of membership management subjects. Blog: Keep abreast of all our new features, offerings and industry news via our blog. Our Membership Academy was designed to house all our educational offerings in one, convenient, easy-to-navigate space. We’ve curated the best articles, webinars, courses, interviews and blog posts to give you an all-rounded educational platform to help you run your membership organization. Take a look around, and start your membership management education today! We firmly believe that success in a membership organization can be achieved by taking advantage of both our software and educational content. That’s why we’re committed to produce both high value education content, and cutting edge software features. Speaking of features...Version 5.6 has been released + we’ve made improvements to our mobile Apps! Version 5.6 is out now. 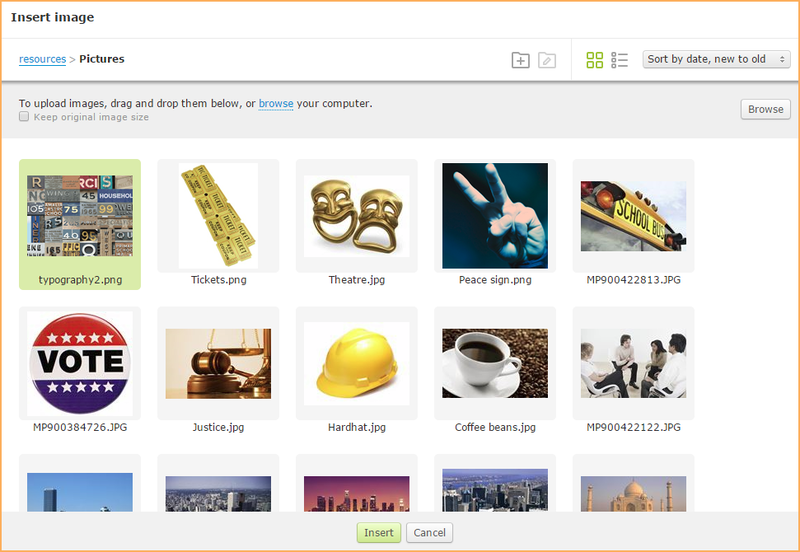 To see the full list of improvements to the process of uploading images and files, see our help page. We’ve also included yet another feature to our events module. 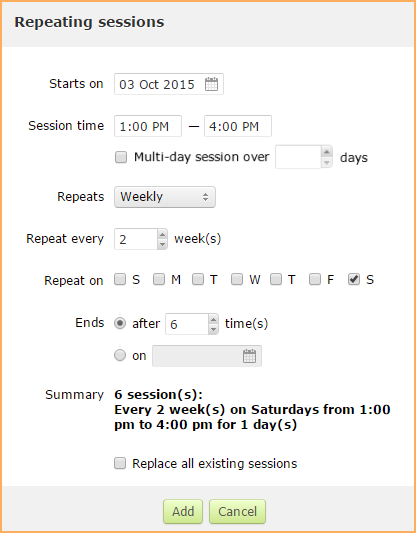 You can now set up events consisting of multiple sessions occurring on different days. This means you’ll be able to schedule multiple sessions for one main event, and your attendees will have to sign up only once! This is perfect for organizations that hold courses, workshops or a lecture series that have more than one meeting date. To read more about how this feature works, see our recent blog post. We’re proud to introduce two new, fully responsive (mobile friendly) theme sets: Terra and Firma. See more variations of Terra and Firma in our blog post. This past week, we also updated both our iOS and Android apps based on your requests: You can now log in to the mobile app using your Facebook credentials. We’ve also made some improvements to performance of the search feature, so scrolling through a large number of contacts on the app is faster and smoother. For a refresher on how our free apps can help you, see this blog post. We will continue to collect feedback from our clients via our Uservoice Wishlist forum. 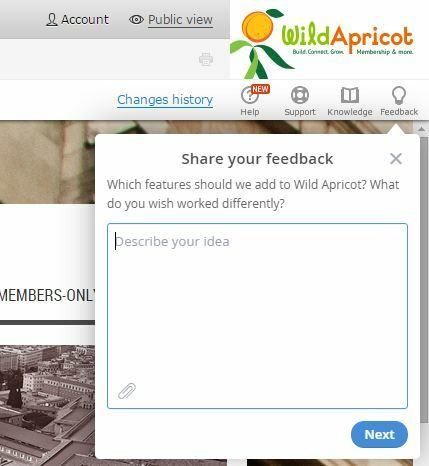 The forum allows you to suggest and vote on ideas that you think would be useful to add to Wild Apricot. Join our forums today and get started. We’re now taking feedback from within Wild Apricot. 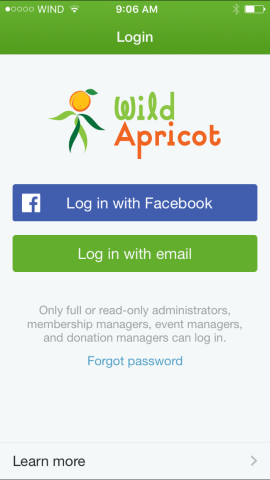 A new icon on the top right of your Admin screen called “Feedback”, allows you to share any ideas you may have about changes in Wild Apricot. 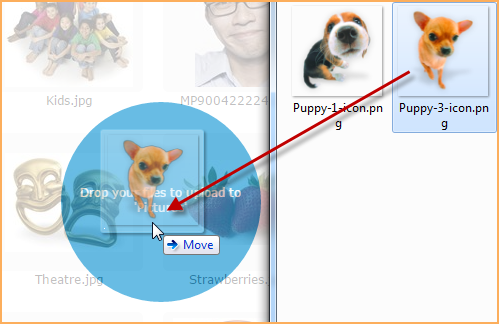 You can also attach an image or file, to further illustrate your point. Over 3,500 people have already submitted their feedback. Log-in today and submit yours! We’re going to continue to use this valuable feedback to design new features and improvements to our software. We will continue to create high-value, actionable educational content designed to help you grow your organization. We will be honest and up-front about our innovations, ideas, wins and learnings. We're looking forward to wrapping-up the fourth quarter of 2015 just as we started it - with you in mind!